These little birds are grilled quickly and brushed with a spicy sticky glaze made fast with store bought preserves and canned green chiles. Serve on a bed of salad greens for a light summertime meal. Spatchcocking these little birds helps them cook evenly and lightening fast. 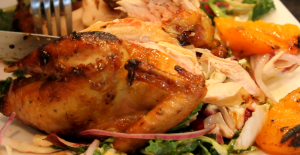 Click on the image on the right to watch Dan and Bobbie Jo prepare this delicious recipe. Mix all the marinade ingredients in a large container and set aside. Place a chukar breast side down facing away from you on a cutting board. Cut along each side of the backbone with kitchen shears and remove the back bone and save for another use. Flatten the bird with your hands by slightly pressing down on it. Then cut along each side of the breast bone and remove it also. The wing tips can be removed if you like. Place all four chukar in the container with the marinade and refrigerate for 24 hours. Mix all the ingredients and place in a lidded container. It may be refrigerated overnight and gently heated in the microwave for 30 seconds. Bring the chukar to room temperature 1 hour before grilling. Split the apricots (or peaches, or apples) in half and remove the pits. Drizzle the apricots with a little oil and sprinkle with spices, brown sugar, salt and pepper and set aside. Remove the chukar and pat dry with paper towels. Re-season the chukar on both sides with a bit more kosher salt and black pepper. Place the chukar on the grill, skin side down for 2 minutes. Flip over and grill the other side for 2 minutes. Turn off the burner and brush the glaze over the chukar on both sides, and remove from the grill. Add the apricots, cut side down on the grill for 1 minute. Turn over and grill the other side for 1 minute (2 minutes for peaches or apples). Remove from the grill and serve with the chukar. *We served the chukar with on a bed of arugula, sliced red onion, feta cheese, candied pecans and raspberry vinaigrette, but you can serve it with any side dishes you like.